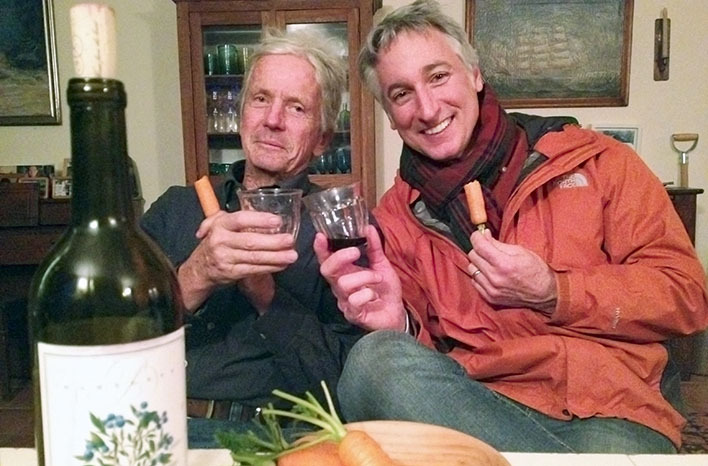 This week’s guest is a legend in the world of organic gardening and farming – Eliot Coleman. Eliot has been a market gardener for over 50 years, yet he remains as excited about his work every day as when he first began. He claims the secret of life is to love what you’re doing – and I have to say, I agree. 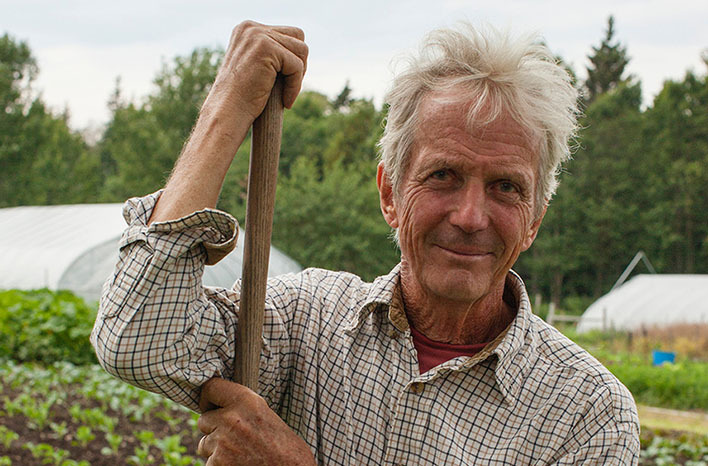 Eliot owns and operates Four Season Farm near Harborside, Maine with his wife, Barbara Damrosch – who is a garden icon in her own right. 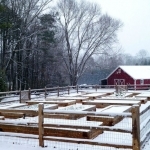 Together, they grow and sell produce all year – even during the bitter winters of their zone 5 region. The Growing a Greener World crew and I visited Eliot Coleman and Barbara Damrosch at Four Season Farm for episode 301 we filmed featuring their winter farming operation. Here, we’re enjoying homemade blueberry wine and Eliot’s famous “candy carrots”. Given his industry reputation, you might be surprised to learn that Eliot didn’t grow up gardening. His interest in horticulture didn’t begin until his late 20’s when he read Living the Good Life by Scott & Helen Nearing. As an avid outdoor enthusiast, Eliot was struck by the adventuresome aspect of farming. He contacted the Nearings, and they became his farming mentors. One year later, he bought a 50-acre piece of property from the Nearings themselves. Heavily forested and with poor soil, Eliot and his first wife, Sue, went to work clearing land and improving the soil. Because they didn’t have much money to spend, they got creative with their soil amendments. Eliot would collect oyster, clam and crab shells from area seafood vendors. He also gathered seaweed from the shoreline, and grass cuttings from neighbors. Although many in the farming industry at that time were focused on using chemical fertilizers for immediate results, Eliot saw things differently. Once – while he was adding clam shells as a soil amendment – Eliot was visited by a county extension agent who couldn’t understand the point. After all, he warned, those shells would take a century to break down and have any impact on soil quality. What the agent didn’t understand was that this was Eliot’s goal. Eliot viewed the work as an investment in farm fertility for his future great-grandchildren. So – patiently and with the long game in mind, Eliot continued working a wide variety of organic materials into the soil on the farm year after year, and these efforts are still paying off decades later. Fifty years on, he and Barbara are still farming the same land and following the same organic principles. They sell their top-quality produce, eggs and cut flowers at their local farmers market and to local distributors. Not satisfied to sit out the winter when it came to growing food, Eliot and Barbara became adept at producing crops all year long. This journey began with an accidental discovery one cold, Maine day. One winter, Eliot realized that, underneath a few cold frames being stored unused beneath a plastic tunnel, the soil had remained unfrozen. He realized that the double layer of protection from the harsh cold and wind was creating an environment in which he could sustain vegetable growth. As it turns out, each layer of covering over a bed of plants moves the conditions in which the plant is growing the equivalent of 500 miles to the south. In other words, by covering vegetable beds with two layers of protection, it was zone 5 outside the covering but zone 7 within the covered area. Today, Eliot and Barbara plant their winter crops in rows under lightweight fabric tunnels housed within 30’x100’ greenhouses. Many leafy greens – including spinach, bok Choy, and lettuce – thrive within these protected areas. Four Season Farm has great success with other vegetables too – like scallions, leeks and carrots. The next logical question might be: Why not add a third or even a fourth layer of covering to create a still warmer environment? Well, there is a balance between trapping heat and allowing light to pass through. As Eliot experimented with adding more layers, he found that too much light was blocked when a third covering was added. The plants weren’t able to photosynthesize successfully, and there wasn’t enough light allowed through to warm the soil surface. He also tried replacing the lightweight fabric with a heavyweight fabric, but that made conditions worse too. Just as with too many layers, the heavyweight blocked so much light that the surface of the soil didn’t warm sufficiently. Instead, the covered area grew colder over time. Eliot has also found that when he plants these winter crops is as important as how he covers them. Plant growth slows once a plant receives fewer hours of light. A seed germinating in low light conditions will become stunted and take significantly longer to reach maturity. However, seedlings planted early enough in fall to allow their root systems to develop before daylight hours wane will continue to produce and grow – in spite of those short daylight hours of December and January. Providing a double layer of covering creates an interior environment for plants which mimics significantly warmer climates, even in the dead of winter. Eliot believes that the secret to success in agriculture is to remove the factors which are limiting to plant growth. Cold, for example, is a limiting factor. 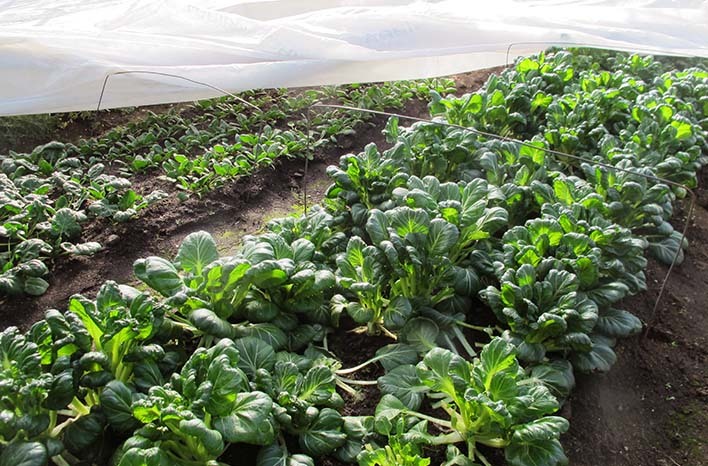 Four Season Farm removes that barrier by enclosing plants within fabric row cover tunnels. Restricted root growth can be another common barrier to plant health. Providing loose, aerated soil within the garden bed can encourage more vigorous root growth, but what about plants at their earliest stages? In the interest of allowing unrestricted root growth right from the start, Eliot plants all his seeds into soil blocks. Soil blocks are compressed soil which has been molded into a cubed shape. The block is not held within a physical barrier – the compressed soil maintains its shape independently. When seedling roots in a tray reach the exterior wall of a tray, they don’t stop growing. Instead, they continue growing around the surface of the interior wall. 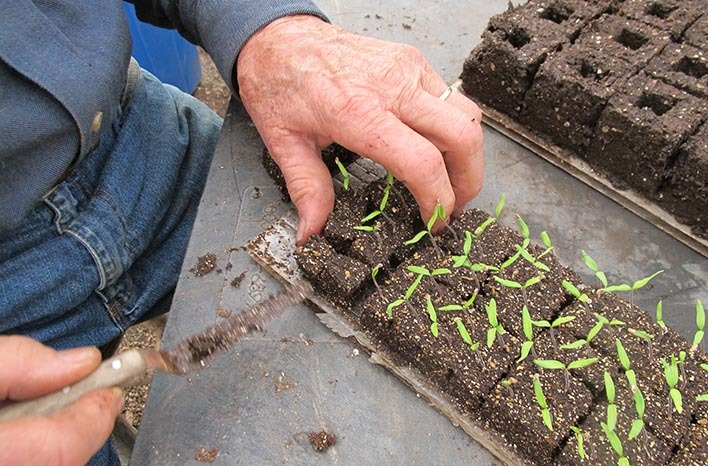 In Eliot’s experiments, he has found that seedlings planted in soil blocks were ready to go into the ground after three weeks, while seedlings planted in trays weren’t ready until week six. The tray-planted seedlings were root-stressed and took longer to develop. With a constant thirst for knowledge and a curiosity to match, Eliot is always experimenting – seeking ways to overcome garden challenges and improve on his success. He is definitely a man after my own heart. 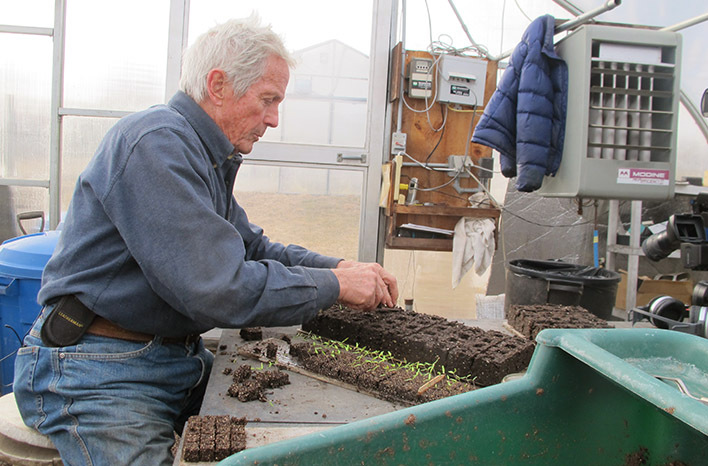 Eliot at work inserting seedlings into soil blocks from the comfort of his greenhouse on a cold winter day. Eliot works by the philosophy that these three approaches are intertwined. After all, when you improve your soil fertility by adding plenty of organic matter, you make it possible for the microorganisms in the soil to work more powerfully. It’s the microorganisms which are responsible for inducing pest and disease resistance in plants as well as for processing nutrients for maximum plant efficiency. And to state the obvious, healthy plants receiving lots of nutrients from the soil will be packed with nutrients themselves. These aren’t new concepts. In fact, they are centuries old. Agricultural dependence on chemicals didn’t take hold until the early 20th Century, when manufacturers began to sell products intended to deliver nutrients. This budding industry convinced farmers and home gardeners that it was necessary to purchase these products in order to be successful. As a result, the agricultural industry became dependent on inputs – and moved away from the permanent, sustainable agricultural practices of centuries past. Organic farmers, like Eliot, are turning the tide back. They have learned to focus on creating as many nutrients on the farm as they can – without having to rely on outside sources. The natural world wants to feed us, we just need to be paying attention to how it works. Compost is a great example of that. The composting process is nothing more than the breakdown of organic material, but it’s the biological process at work during composting which fuel all the complex and important functions of soil. Eliot loves his compost as much as I love mine. Not only does it fuel our soil, compost is free and reduces waste in our landfills. What’s not to love? Minerals are also important for plant growth. We can incorporate mineral amendments, but here again, we may be underestimating the power of the natural world. In fact, plant roots have been found to actually etch minerals out of rock surfaces. How effectively a plant is able to bring up nutrients and minerals from the soil and subsoil is dependent on how deeply the roots of the plant are able to grow. If given the opportunity, plants have the ability to seek, grow toward, and locate what they need within a healthy soil ecosystem – without relying on supplements from humans. Soil blocks are compressed soil which hold their shape without a structure. It’s the method Eliot uses to start seeds and has been for decades. Transplanting into the ground is made possible in half the time vs. plastic cell packs. Organic practices focus on utilizing deep solutions rather than quick-fix, surface solutions through the use of chemical products. Eliot compares synthetic fertilizers to taking a drug for a quick pick-me-up. Sure, the drug will provide a spike in energy, but it isn’t a long term solution when he’s feeling run down (not that Eliot ever feels run down!). Synthetic chemicals can solve pest and disease and fertility issues – but only on the short term. Long-term, your nutrition shortage returns, diseases take a heavier toll on plants which grow weaker due to a lack of soil health, and your pest problem can actually worsen. 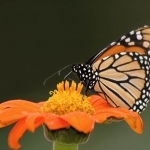 Historically, each time a new chemical control product has been marketed, it hasn’t taken long for the target insect pest to develop resistance to the product. Why? The fact is, a few insects always manage to survive treatment. The survivors breed, and their natural resistance is passed on to their offspring. A few generations later, the species has become resistant to the chemical. Organic farming is about changing the system – working with nature to make the best use of natural processes and find creative solutions to solving problems of fertility, pests and diseases. In addition to cost-savings, it’s the creative problem solving which first drove Eliot to become an organic farmer. 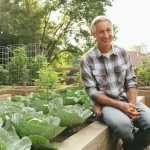 He compares organic farming to one of his former favorite past-times – rock-climbing. Rock climbers are always on the hunt for the best way to the top of the mountain, and for most, it’s the discovery of a better path which is the most rewarding aspect of the sport. With gardening – there is no top of the mountain. We all just keep on climbing and looking for better ways to make the growing experience more fruitful and efficient. The constant challenges which come with organic farming are what continue to excite Eliot 50 years later. I love that approach. Just like Eliot, I believe one of the best parts of gardening is to continue to learn, continue to experiment, continue to examine any perceived failures to identify the lesson which will help you to do better next season. Soil blocks can be made into a variety of sizes. 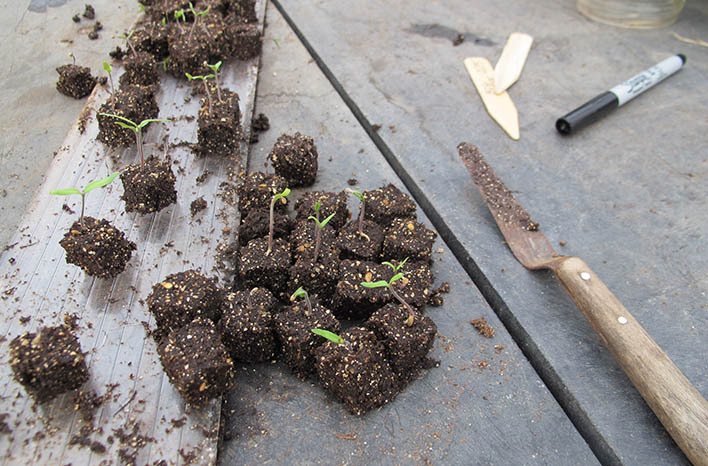 As the seedling outgrows the smallest block, that small block of soil can be inserted into a larger soil block. These seedlings will be in the ground 3-weeks after germination. Each year, Four Season Farm utilizes an ancient practice known as “ley farming.” Eliot and Barbara plant half of their crop space with a deep-rooted cover crop, such as a legume mix. They bring in their livestock and allow the animals to graze there all season. Not only does the legume crop fix nitrogen into the soil, it’s roots are adding organic matter to the soil surface. The animal manure breaks down over time to add additional nutrients. At the end of the season, the cover crop is broken down into the soil too. This age-old method is inexpensive and keeps the soil of Four Season Farm rich and productive. In an organic garden, we likely don’t have the space to rotate crops and graze livestock. Instead, we work within natural processes through the addition of organic amendments to feed the soil food web. Eliot considers organic farming and organic gardening to be two very different applications. Organic farming is about changing the system, while organic gardening is about changing the inputs. Organic gardeners are encouraged to use organic fertilizers like soybean meal or bone meal. These organic materials are a big improvement over synthetic fertilizer products. However, Eliot believes that, to whatever degree possible, it’s best to provide long term soil health to prevent fertilizer – what Eliot refers to as “rescue nutrition” – from becoming necessary. Soil health, like all of gardening, is a process. There is always room for improvement, and with a little bit of effort, it just gets better every season. 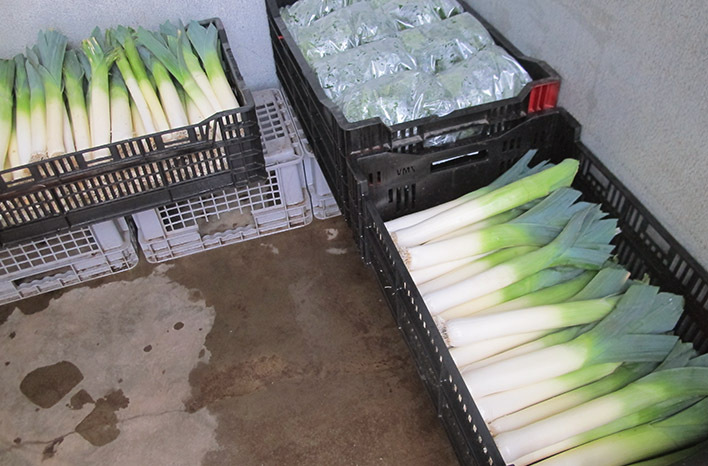 Leeks are just one of many crops that Four Season Farm produces and sells through the winter. I highly recommend that you listen to my conversation with Eliot (if you haven’t done so already). He shares some additional stories of his early farming years, and you’ll hear him discuss his love of books, a few more garden experiments, his recent speaking engagement at The Oxford Real Farming Conference, and why he is so passionate about sharing his garden knowledge with others. It was a great conversation – picking up where we left off from my time on his farm while filming for Growing a Greener World®.